When Time magazine introduced 2014 by announcing ‘The Mindful Revolution’ had arrived, jaded executives everywhere, looking for ways to manage their own version of ADHD, looked up from their spreadsheets momentarily and gave breathing a try. But many didn’t stop long enough to discover the secret behind the power that lies at the heart of mindfulness. 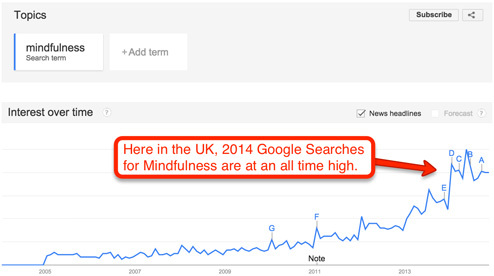 The data confirms, interest in Mindfulness is at an all time high. I was recently watching a re-run of the movie Limitless staring Bradley Cooper, about an out of work writer who discovers a top-secret designer drug that bestows him with super human abilities. The drug allows him to use 100 percent of his mind and makes him laser focused and more confident than any person alive. It’s a seductive idea and the stuff of science fiction, but what if you were offered a pill that you could take once a day that would at least reduce anxiety and depressed mood, increase your energy levels, enhance the capacity of your mind to focus and improve decision making. Well, a review of the scientific literature for the past 15 years suggests that the psychological equivalent of a pill may exist. It’s called mindfulness. But beyond its role in stress reduction, why is mindfulness such a critical tool for business leaders? There are many ways to explain mindfulness, what it is and what it does, and how it works. Essentially it’s a form of meditation. It involves paying close attention to the mind and body in a focused way that allows the mind to settle into its natural state of calm awareness, free of the distractions of compulsive thought and fantasy. In a business environment where the pace of change is unrelenting, to show up to work with a peaceful focused mind that is nimble and adaptable – more responsive than reactive – is certainly a powerful tool. The prolific interest in mindfulness in the West can be traced to the Mind and Life Conference held in Dharmasala, India in 2000. At that conference some of the best scientists in their fields met with the Dalai Lama to discuss what relationship there could possibly be between the centuries-old practice of meditation and mindfulness and modern science? I recently met with two contributors to the Dharmasala conference, Richard Davidson, a leading neuroscientist from the University of Wisconsin-Madison, and Alan Wallace, arguably the most authoritative scholar and interpreter of mindfulness to the West. Both men have been involved in pioneering the science behind mindfulness for many years. They refer to a long list of scientific publications documenting the effectiveness of mindfulness in reducing a range of stress related diseases, as well as cultivating a sense of overall well being. And, as Davidson’s feature article in this month’s edition of Scientific American reports, there is nothing soft about this data. 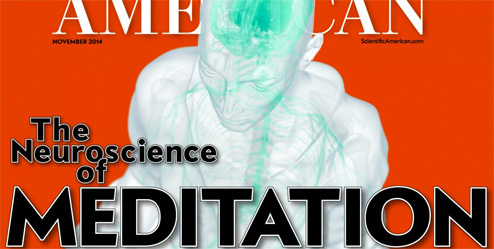 Davidson has demonstrated convincingly that meditation and mindfulness produces significant positive changes in both the function and structure of the brain. As the scientific data supporting the benefits of mindfulness grows, so does its popularity, especially among business leaders. Of course, the initial attraction of mindfulness to business leaders is often as a stress-reduction technique. The ability to clarify the mind and relax the body as a way to relieve stress is compelling. In many ways, the goals of mindfulness overlap with many of the objectives of clinical psychology, psychiatry, preventive medicine and education. As we understand more of the neuroscience behind mindfulness, how it changes the brain, boosts focus and eases stress, it will continue to attract more adherents from the corporate world. But I would go further and argue that this is an altogether too limited view of the potential value of mindfulness practice to business. Mindfulness at its root is a spiritual practice. By spiritual of course I don’t mean religious. In a genuine effort to distance the secular practice of mindfulness from its original role in nearly all religions, secular trainers often forget that the core of mindfulness is the cultivation of the mind’s potential. Being spiritual is about the experience of awakening to your potential and becoming more aware of your true purpose. By cultivating insight a person becomes more intimately acquainted not only with their behaviour, but also with their motives. In particular, they become more conscious of the values that both guide their actions and create a sense of meaning and purpose. The leaders I’ve met who regularly practice mindfulness have two things in common, they are values-based and have a clear sense of the value of what they are trying to achieve – their mission. They manage to connect their own purpose to the company’s purpose and, as such, provide the inspiration critical to a new generation of employees looking to work for businesses that have a clear purpose and create multiple kinds of value. This may initially sound a bit too touchy-feely to business leaders and HRDs trained to focus on commercial realities and the bottom line. However, leading economist, Robert Reich suggested recently that we’re moving into a completely new economy. In this age of networked intelligence, every aspect of business as we know it is being disrupted by technology and the participation economy. Customers are demanding that organisations contribute to a greater good and do more than just make money. Young employees today want to work for more than just a paycheck; they want their work to matter. According to Robert Safian, editor of Fast Company, 90 percent of respondents to a recent change.org study reported being willing to give up some financial reward in exchange for making a difference in the world. In other words, businesses are being asked to provide a double bottom line, both personal and professional. Reich went on to suggest that in this new economy “we have no idea where new leadership insights will come from.” I disagree! The evidence from behavioral science, including behavioural economics, is increasingly compelling. To succeed in the new economy, businesses will need to be led by emotionally and spiritually intelligent leaders who have a clear personal and professional mission that inspires a passionate, engaged, workforce and loyal customer base. They will need to be more conscious of a higher purpose and more aware of their impact on the world, the environment and the economy. The emotional and social architecture of these skills have been described clearly by emotional intelligence, along with the clinical support offered by neuroscience. The evidence for the efficacy of mindfulness in the reduction of stress is beyond question. And, although mindfulness may not be a panacea that provides access to limitless intelligence, it certainly holds promise as a vehicle for cultivating a mind capable of achieving higher peaks of emotional and cognitive function. Breathtaking! We’ll be joining Martyn Newman in London on March 19th and 20th 2015 for Europe’s largest emotional intelligence summit: EQ Summit.